Soups like this one are very nostalgic to me. One bite with its familiar and comforting flavors transports me back to Europe. I’m biased but I stand by the conviction that some of the best soups and stews come from Germany and France. And not surprisingly many of their soups share quite a bit in common with each other. 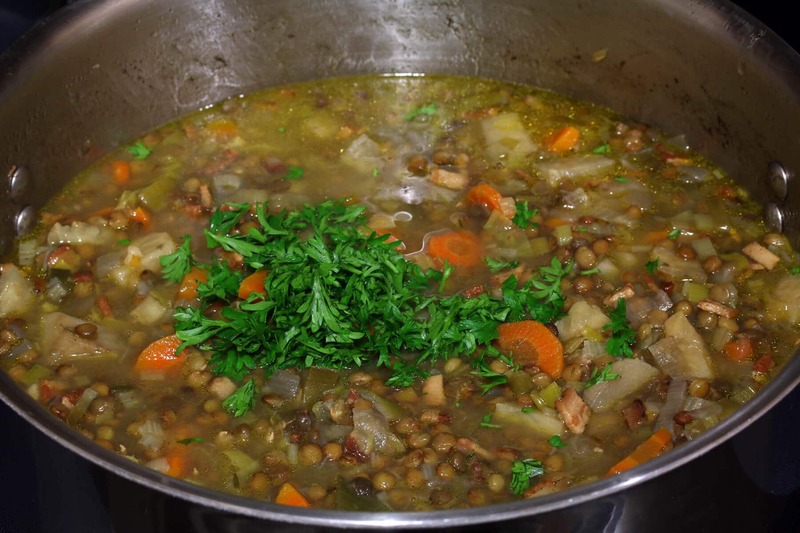 This French Lentil Soup could just as accurately be labeled as a German soup as the ingredients and flavors are very typical of what you’d find in many regions of Germany as well. But since we’re using French lentils and because you can find soups like this in France as well, we’re going to go ahead and attribute this one to France. So here’s to my French friends and French food fans. Vive la France! 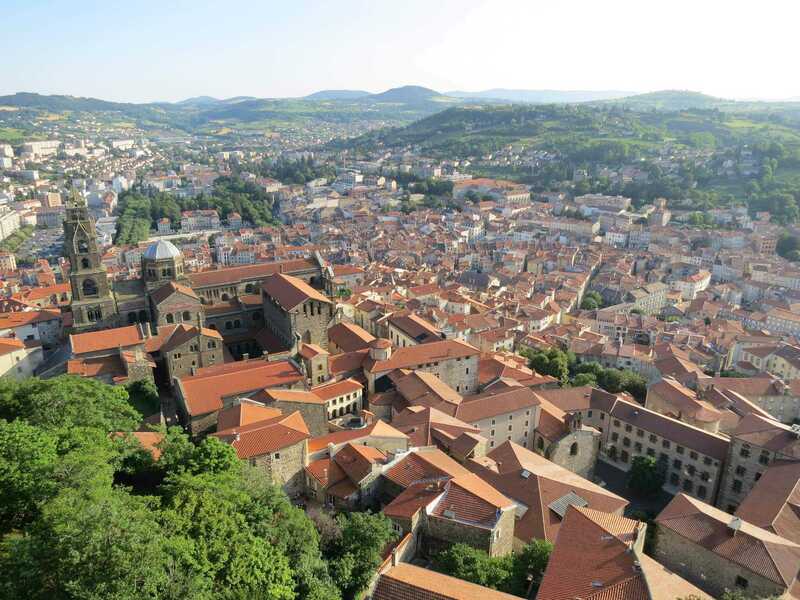 Today’s soup takes us to the Le Puy region of France. 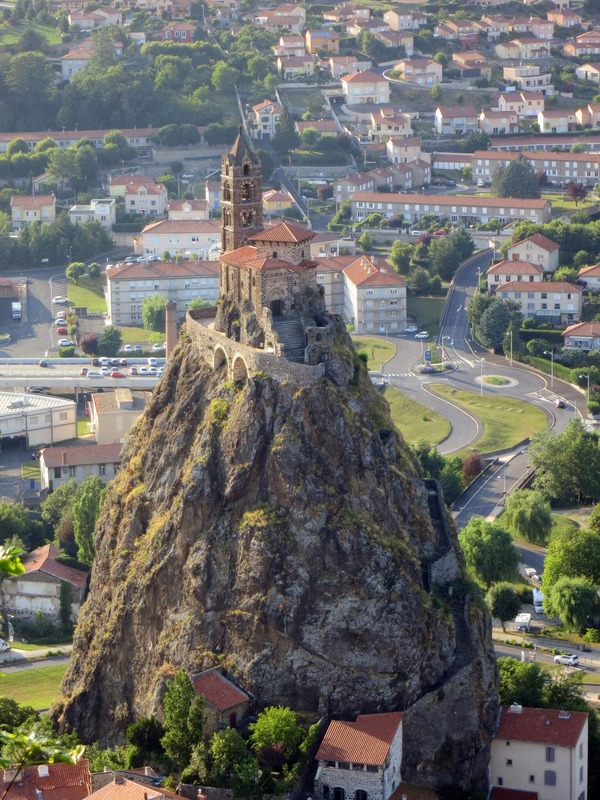 Le Puy is famous for its cathedral, lace-making and…its lentils. 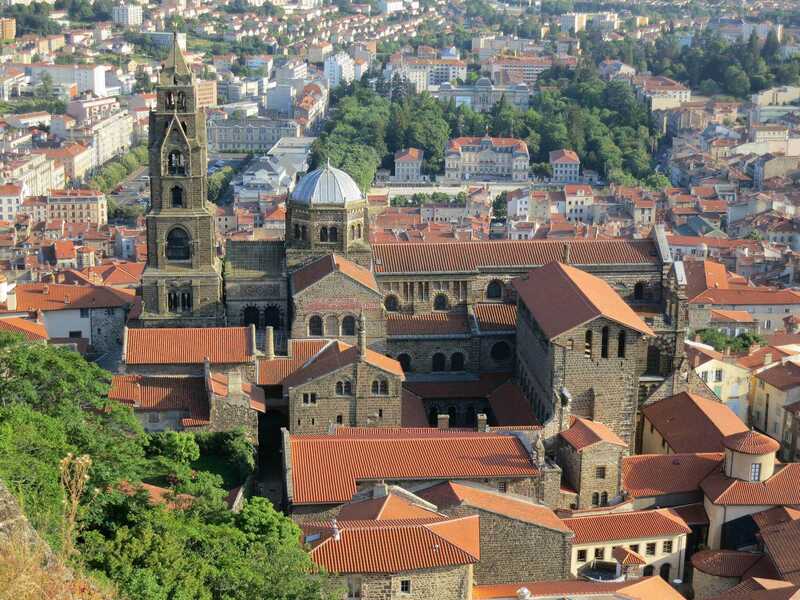 It’s home to the Le Puy lentil, commonly referred to as the French lentil. 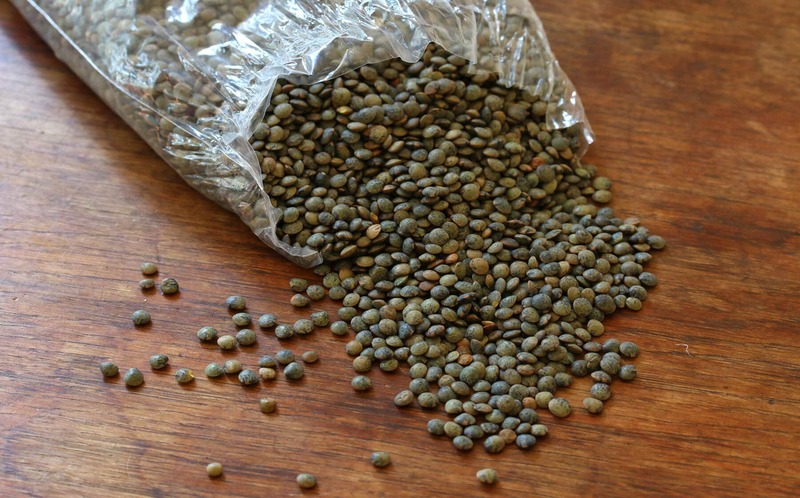 What distinguishes these lentils is their color, flavor and shape-holding characteristics. 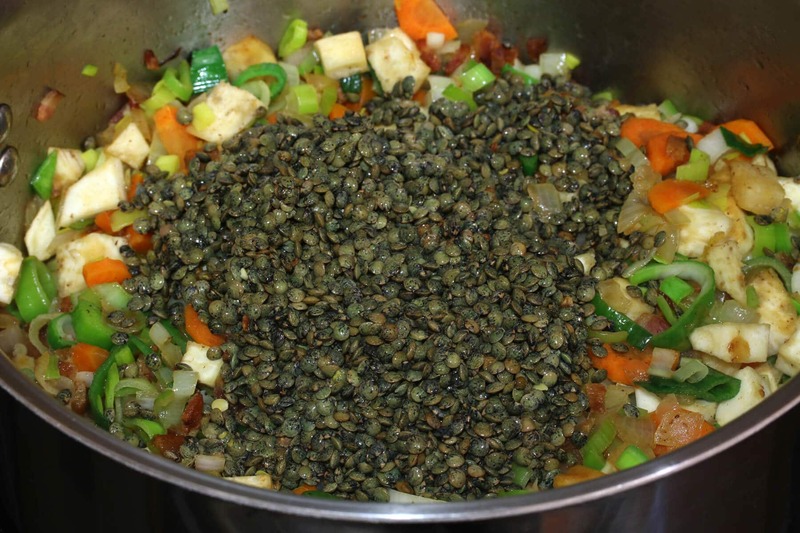 Le Puy lentils are small with a slate-green color and blue marbling. They have a slight peppery flavor and are preferred among many cooks because, unlike their brown lentil cousins that turn mushy after a while, they hold their shape during cooking. 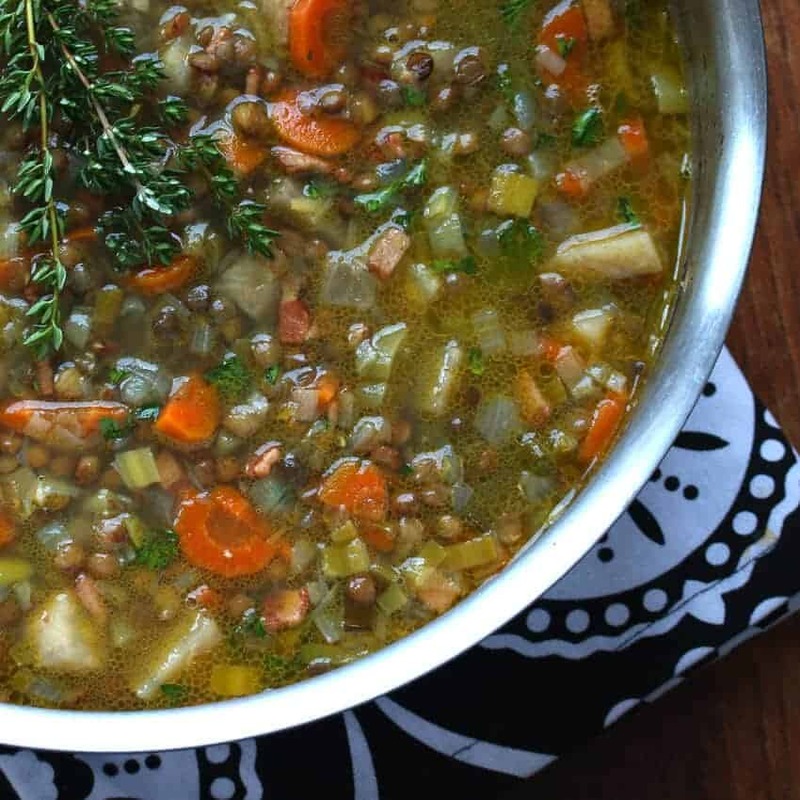 This French Lentil Soup is deliciously rich and satisfying. You’re going to love it! Ready to make some soup? 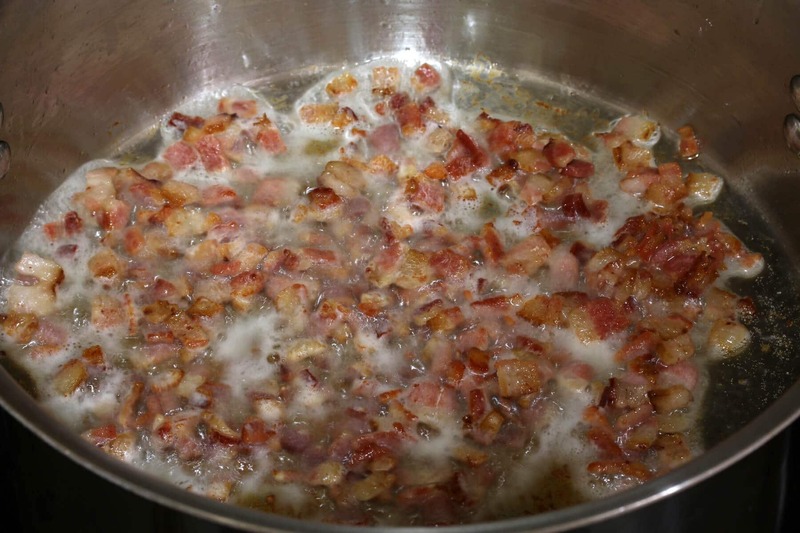 In a stock pot cook the bacon over medium-high heat until done. 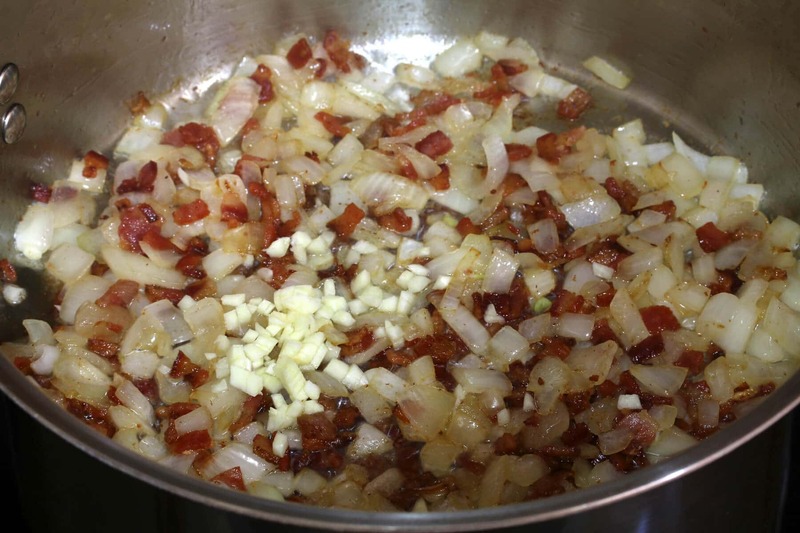 Add the onions and cook until soft and translucent and golden, 7-10 minutes. Add the garlic and cook for another minute. Add the celeriac, leek and carrots and cook for another 4-5 minutes or until beginning to soften. Add the lentils and cook for another minute or two. Add all remaining ingredients except for the parsley and bring to a boil. Reduce the heat to medium, cover and simmer for 30 minutes. Stir in the parsley and add salt and pepper to taste. Serve with some crusty bread and/or a leafy green salad. 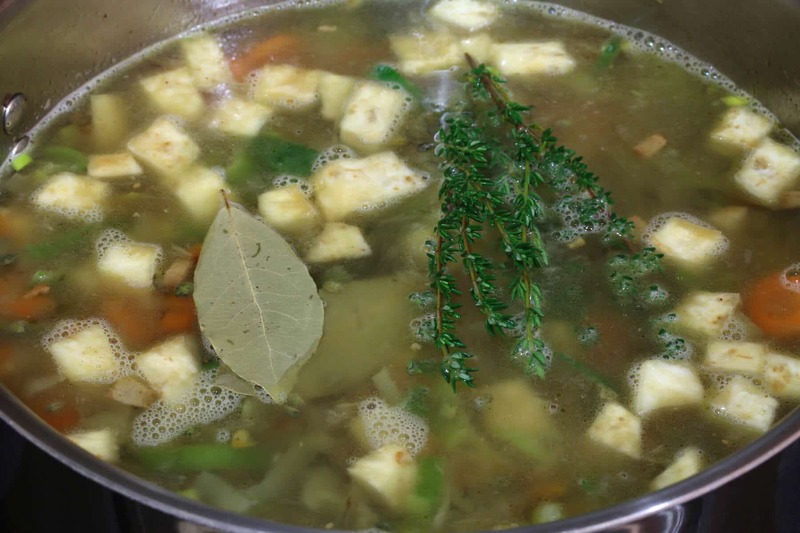 This soup makes excellent leftovers and the flavors will be even more pronounced the next day. 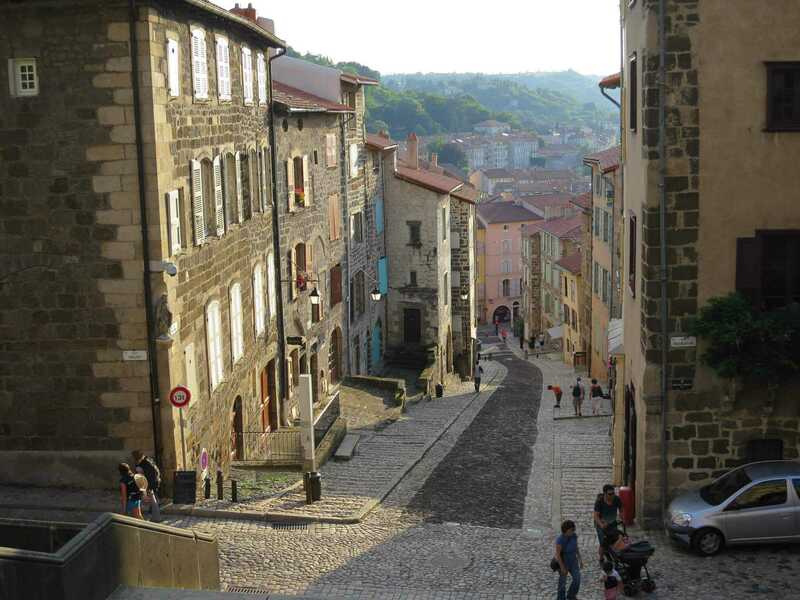 Travel the French countryside with your tastebuds! This soup is deep and delicious with layers of flavors that will keep you happy the whole meal through. 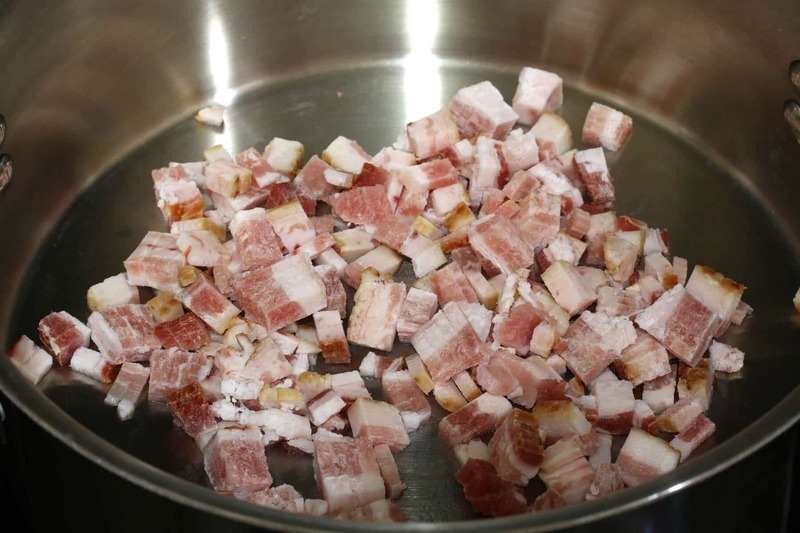 In a stock pot cook the bacon over medium-high heat until done. Add the onions and cook until soft and translucent and golden, 7-10 minutes. Add the garlic and cook for another minute. Add the celeriac, leek and carrots and cook for another 4-5 minutes or until beginning to soften. Add the lentils and cook for another minute or two. Add all remaining ingredients except for the parsley and bring to a boil. Reduce the heat to medium, cover and simmer for 30 minutes. 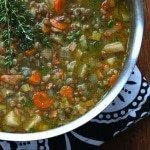 I always love myself a hearty lentil soup! Thank you for sharing this amazing recipe! Gotta give it a try this weekend! Lentils are by far my favourite vegetarian protein. But they aren’t just for vegetarians, as you have shown! The addition of bacon is so perfect here. Lentils have never looked better!! I want this for dinner tonight! How can you possibly go wrong with bacon and lentils? Its gotten cold here again so I think a nice big bowl of soup is in order! This looks fantastic! Thanks for sharing with us! So delicious! I love France and can’t wait to go back there. Bacon and lentils, what a great combo! I love the pictures and of course, this soup! Lentils are the best! Adding the juice of one lemon at the last 10 minutes gives it an impressive kick! Those photos of France don’t even look real! Amazing! I hope to visit there this summer :) Love the soup and can’t wait to try it! 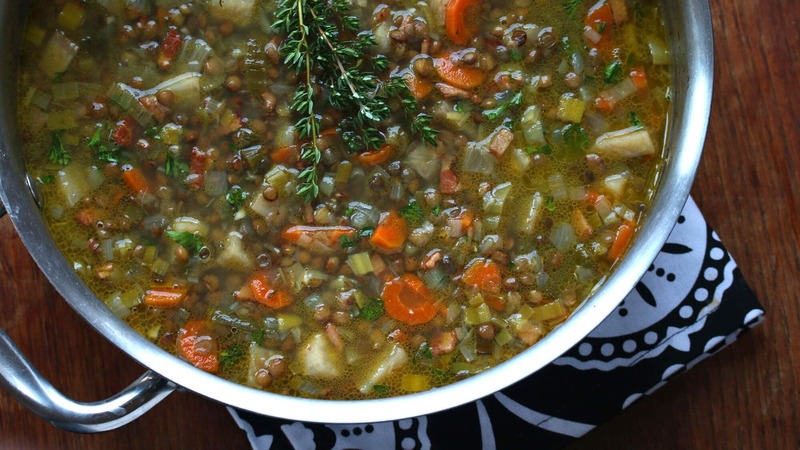 Lentil soup makes me nostalgic too – this is a childhood favorite! 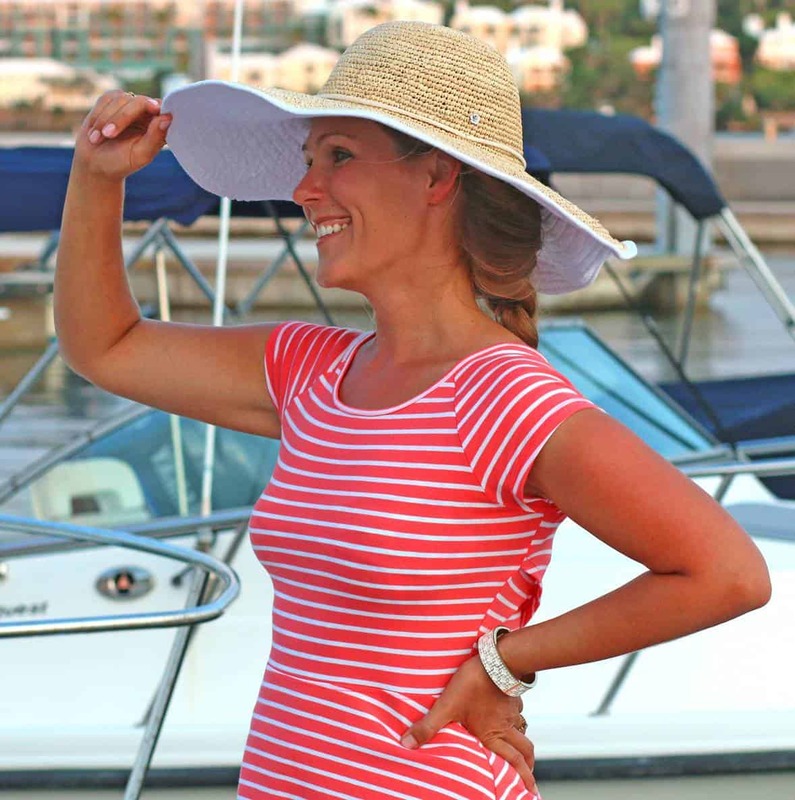 thanks for sharing the beautiful photos – and the recipe! Where can I buy french lentils? Hi Jeanie, you can buy them online, like here on Amazon, or at some grocery stores that carry a large selection of bulk food items (eg, I’ve seen them at WinCo). This soup is pure bliss! It’s so warm and comforting for spring…yum! My husband was seriously drooling over this soup. I have emailed to him to make. Loving all the flavors in it! I love foods that transport me back! Love this soup and all of the photos of France! I haven’t been there since I was in highschool but it was wonderful! Love this hearty looking soup – perfect for these still chilly days before temperatures start to rise. That looks like a big bowl of love to me! Mmmm! That pic of the castle on the rock or hill?? What is that place, so cool! 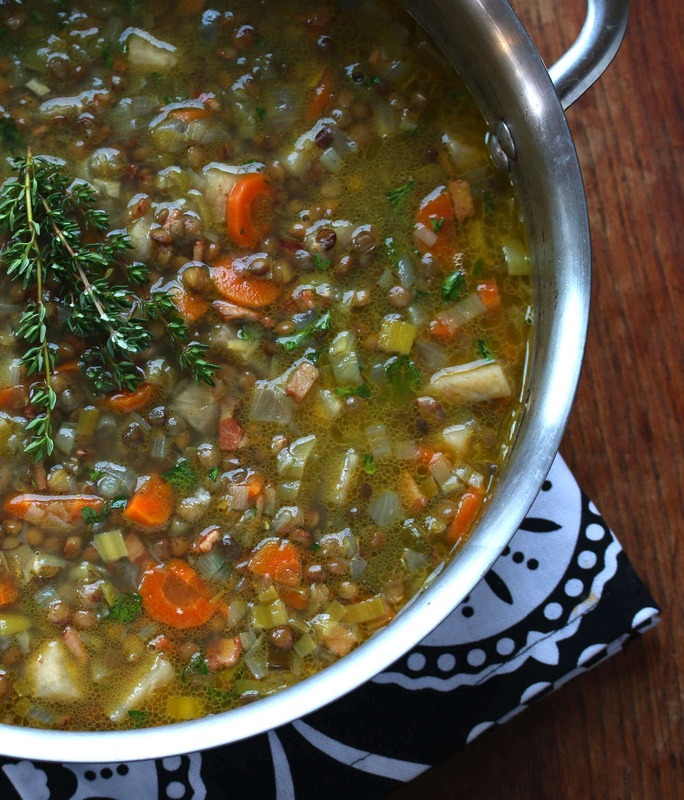 One of our favorite soups, usually made with green or brown lentils. But puy sound good as well! That castle on top of the hill (rock?) is exquisite. And this soup sounds lovely too. So fresh and inviting. Love lentils! 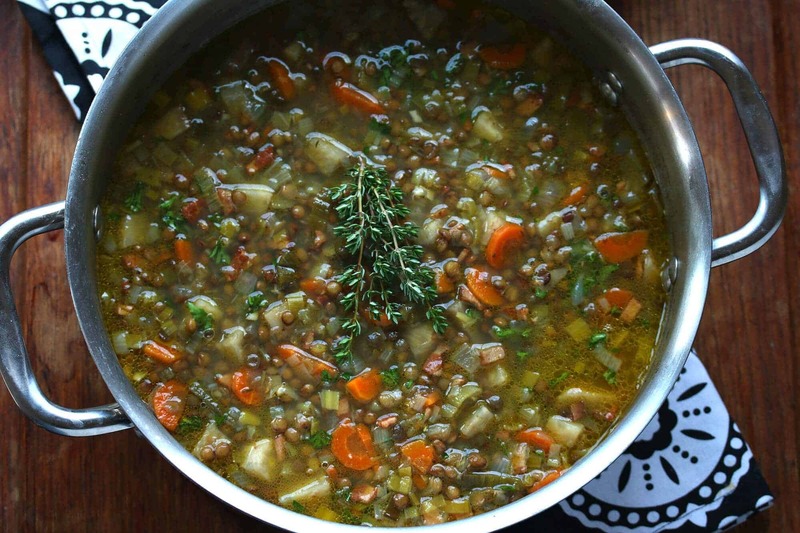 French Lentil Soup is one of my favorites. You really can’t go wrong with lentils, bacon, and onions in any combination. As I sit here gazing at a fresh 18 inches of snow that shows no signs of stopping, a big bowl of this soup is definitely in order. Great soup! Can anyone tell me how many calories are in a portion? That’s great thank you. I should have also asked you – what weight is in a portion or serving? Thanks a million. What the weight is, I don’t know, but these calculations are per serving for a total of 6 servings. What can you use in place of the bacon to give it a more complex flavor. I don’t eat pork. Hi Danielle, have you found something you like that you usually use in place of bacon in recipes that call for it? One idea would be to use turkey bacon instead. I ommitted the bacon and fried lightly the onion and other veggies in duck fat (in a cast iron frying pan). Then deglazed the pan with white wine and added everything to the pot with lentils. Duck fat makes practically everything taste better, Marguerite! :) Glad you enjoyed the soup, thank you! 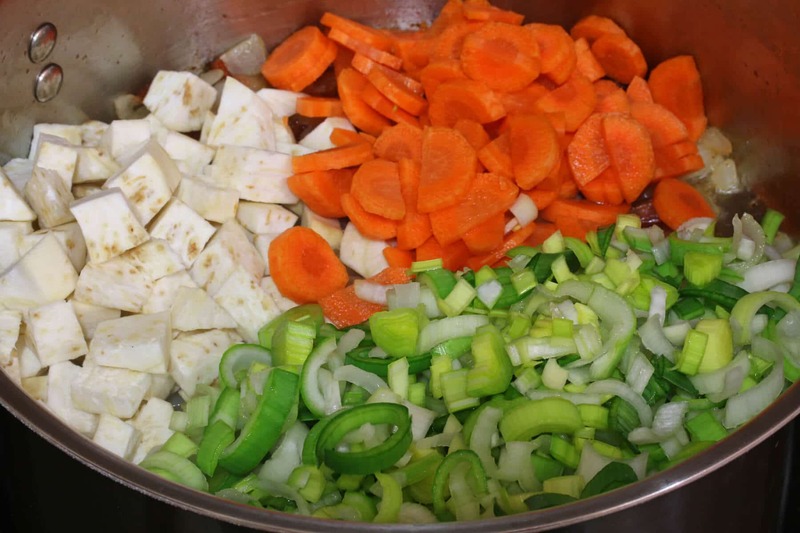 This is on the stove now – doing a veggie version without bacon and using veg broth – I love the comment suggesting the use of duck fat – will add that to my pantry soon – great idea as one son is a “whoknowswhat-atarian” – rules to what proteins he will eat – duck passes. Also I am intrigued by the absence of tomatoes as most other recipes I looked at had those and looking forward to this exceptional recipe. Thank you, Marialice, I hope everyone enjoyed it! Just veganized this. Used olive oil and a little coconut oil. Subbed one and half lemons for wine vinegar. And, wow! This is just terrific. Awesome, Elaine, thanks for the feedback! Easy and delicious. Thank you for sharing! Thanks, Mike, I’m glad you enjoyed it! Best Lentil Soup I’ve ever made or had. I’ve shared this recipe at least 4 times now. One quick trick I got from cooks illustrated was to soak the lentils in warm water (100 degrees) with a tsp of salt for an hour. Then rinse and drain. Apparently it softens the shell a little and minimizes the cracking during making the soup. This also freezes in a ball jar really well. Thank you, Carolanne, I’m so glad you enjoyed it and appreciate the feedback! 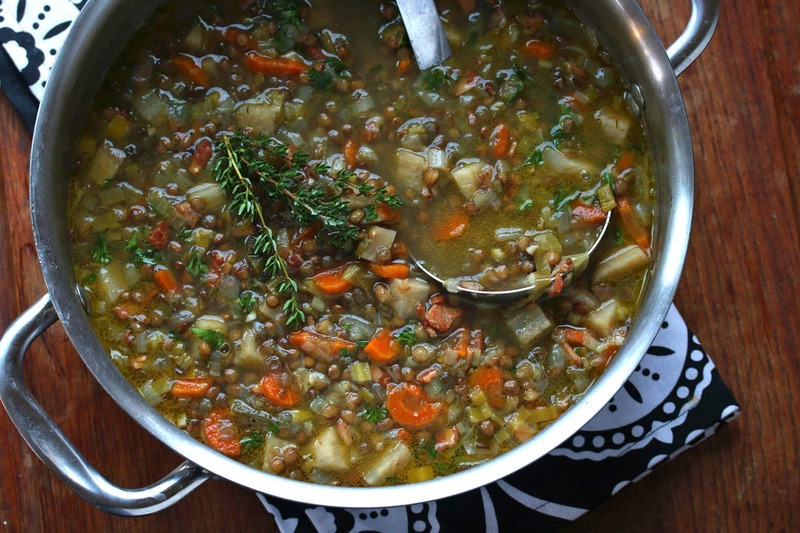 I’ve been looking for a French lentil soup recipe that isn’t tomato based. I decided to make this on a whim and didn’t have celeriac so doubled up on carrots. It was such an amazing, delicious and simple soup. My one criticism is that the soup is way too salty – and I love salt. I had to add nearly the same amount of water as stock. But the soup is so fabulous that I’ll be making this many times again and add salt to taste. Fabulous recipe! Thank you, N, I’m glad you enjoyed it and appreciate the honest feedback! This soup is amazing. Really enjoyed the aromas as it cooked. Will be making this regularly. Thanks so much . Thanks so much, Vicki, I’m glad you enjoyed it!